This is a sale for a brand new genuine Honda Accord Prelude H22A H22Z F20B DOHC VTEC Mainshaft Distance Collar Needle Bearing 37x42x14 from Honda Motors, Toyo, Japan. It will fit the aforementioned applications from 92-01 H22A-series, 99-01 H22Z-series & 98-02 F20B DOHC VTEC manual transmissions. 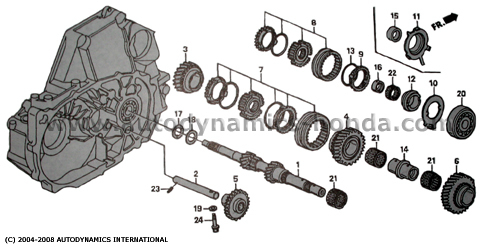 This mainshaft distance collar needle bearing (No.22 in the H22-series F20B DOHC VTEC hydraulic transmission mainshaft components diagram below) is located at the sleeve set synchronizer 5th.